The lady to the left is Lady Selina Meade and that portrait is one I used as the cover for my first novel, which is the subject of this sleazy sales pitch. I didn’t know much about Lady Selina at the time I grabbed her royalty-free image from the Internet other than she was from the right period and had the right colouring to kind of sort of imply a vague identity with the heroine of the novel. To be honest, Elizabeth Randolph the heroine of A Step Beyond Context is probably not so pretty and a little more hard faced. She is after all not only a Regency heroine but also a veteran mercenary hacker from a dystopian future world, equally at home in low bars and firefights as she is in ballrooms and parlours and discussion of the latest styles of folding a neck cloth. But I chose the picture for the cover (having suddenly realised I needed a cover) and now I kind of associate Lady Selina with Elizabeth. I suspect both women might be a little insulted if they knew. The reason I’m waxing lyrical about the book is that it’s almost exactly a year old, in that it was released for sale in February 2018 in a mad rush of activity on my part. A week after it went live I found an egregious error in the last chapter and thanked my lucky stars that it was the work of an hour to correct it, reupload the corrected manuscript and then grovel to the early adopters to please forgive me and redownload their Kindle versions. So far as I know only a couple of paperbacks with the mistake in ever made it into the wild and those people I know who received them now have shiny corrected copies. To those people I say REJOICE for you also own a collector’s item wherein a significant character who disappeared early in the book reappears at the end with a new name and presumably a spray on tan and a wig. I’m working on finishing the first draft of my second novel, the early memoirs of a mid-Victorian magus and his unwilling and unwitting forays into the politics of the insular world of his magical peers and the wild and unpredictable Faerie intrigues that lurk at the edges of London’s sooty sprawl. That should be out later this year with good fortune and a following wind, but it has dawned on me that I’ve done a poor job publicising my first wordy-offspring. Perhaps it’s a result of being brought up British, but I’m utterly bobbins at self promotion. My attempts to promote A Step Beyond Context largely consisted of me mentioning in various online places that it existed and shyly stepping away before anyone thought I was getting ideas above my station. But Britain is a complicated place these days what with Brexit and everything so I’ve decided it’s time to be less bloody traditionally British and actually blow my own trumpet. 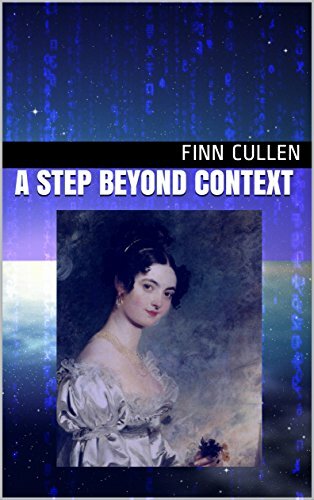 A Step Beyond Context is a novel that defies genre. One reviewer (who I do not know personally!) described it as being as if Georgette Heyer had written Blade Runner which I was immensely tickled by and pleased with. It’s a mystery at its heart centred around the character of the aforementioned Elizabeth Randolph, who is a daughter of a family with the ability to travel across parallel universes and who are gathering together in their quaint old Regency style home for the birthday party of the pater-familias, a grouchy old Duke in the failing years of his unnaturally extended life. Things take a turn for the unpleasant with a fatal accident that might be the first move in a more sinister plot that sends our heroine across a number of worlds in search of a secret that may well tear that family apart. Along the way there are necromancers, pit fights, Jillbots (you’ll find out) and a talking crow. I think it’s great, and I should know because I wrote the thing. If this is the sort of thing you like then you’ll like it too. It’s available for sale in paperback and Kindle formats via Amazon at the following links (check your local version of Amazon, it’s spread to most of the venues) in the Now Without The Egregious Error version. If you do pick it up and you like it please leave a review – they are like Faerie gold to authors but more lasting – and spread the word. That’s pretty much all the auto-trumpet-blowing I have in me, and I thank you for your indulgence. Now take those pretty words and shove them in your pocket and run before the coppers show up and run us both in for buying and selling moonshine ideas.